Calories do count but not everyone need count them! Calorie counting is the method of recording the calorie (or kilojoule) amount of each and every food and drink you consume every day. It can be done using a food journal, an app, or by simply recording the information on a spreadsheet. Alternately calorie-based meal plans can be prepared in advance and then followed exactly. Calories and only calories matter and must be counted. Calories don’t matter – it’s the macronutrients (i.e. carbs, protein, fats) that mean everything. As a matter of energy intake and output, calories mean everything. As for health and nutrition, the macronutrients do matter. Think about this: If you decided to go on an 1800 calorie per day diet – would you consume all your 1800 calories from diet soda? Or live on a diet of 100% fat? Probably not. So macronutrients do matter to some degree. So what’s the answer? If you are trying to lose weight then calories do count, and depending on your individual body constitution – macronutrient ratios will also have impact on the success of your fat loss program. This is why a section of the population do respond to low-carb diets, and others respond to low-fat. Get the calories right first – THEN experiment with nutrient ratios. But I Hate Counting Calories! You are not alone. Calorie counting is not for everyone, it can make eating food that was enjoyable into a painful obsessive ritual. It works well for some, but not for others. However, you need to get some idea of the quantity of food that gives you weight loss success. Eating until satiation (i.e. until you’re full) is not always reliable. It can be worth calorie counting for a week or two – then once you’ve figured out the portions of food that are working for you, you can stop being obsessive and wing it. If you have problems with portion distortion – then ‘winging it’ may not be wise. 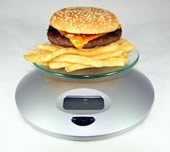 If you want to do-it-yourself, you have to determine the calorie amounts of all food you are going to eat or have eaten. They must be recorded on a daily basis. You will also need to set your daily calorie amount for weight loss. It can take time, and it is not for everyone. Many on-line programs will record your personal statistics and create your daily calorie-controlled meal plans for you. It’s a time saver – which is why some people choose this way. See our Diet Plan Reviews for recommendations on subscriber diet plans. Calories & Kilojoules – Understanding what the calorie is. Calories in Food – Calorie amounts of basic food items. What is the high protien?